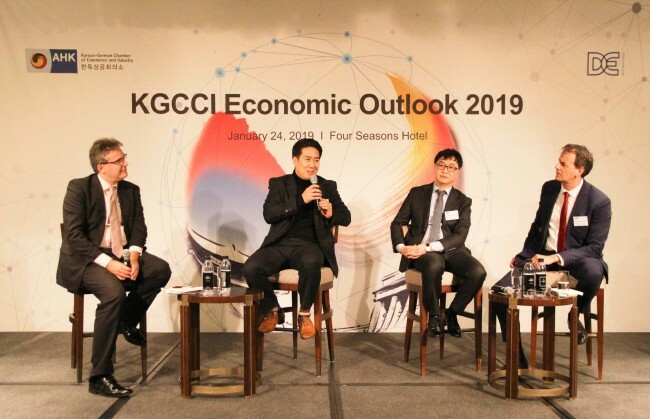 The Korean-German Chamber of Commerce and Industry hosted a forum Thursday to discuss the prospects for the nation’s economic growth. He also stressed the importance of fair treatment of foreign companies, including the reduction of non-tariff trade barriers and of “Korea only” regulations. Alexander Hirschle, director of Germany Trade & Invest’s Korea office, said he expected a decline in Korea’s gross domestic product to around 2.5 percent this year due to several risk factors, including an intensifying trade war, growing unemployment in Korea and the end of the semiconductor boom. He said it was important to find new growth motors like 5G networks, electric and self-driving vehicles, and artificial intelligence. During a panel discussion on the topic “Innovating Korea,” Marc Bovenschulte, director of Institute for Innovation and Technology in Berlin, said “Korea and Germany are both innovation-driven economies,” adding that both countries can get further impulses toward competitiveness by strengthening cooperation between traditional SMEs and high-tech start-ups.